Sometimes people do amazing things: change your flat tire, give you rides to the airport, fly on the trapeze with the greatest of ease. These occasions call for bread. These heroes need your bread. Many times these heroic deeds happen without much warning and your pantry is not prepared with say, bananas or pumpkin or cream cheese. 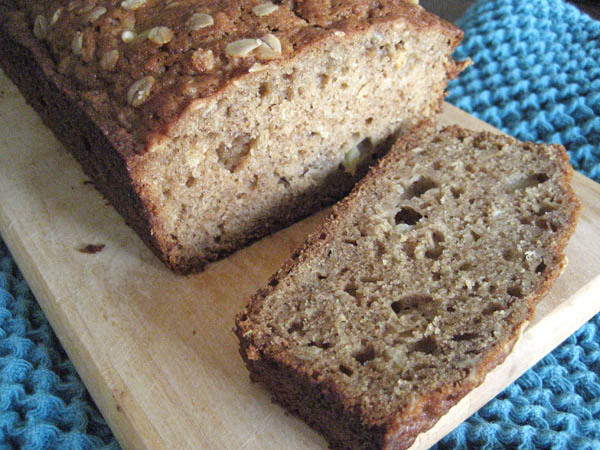 Enter Oatmeal Applesauce Bread to save the day. 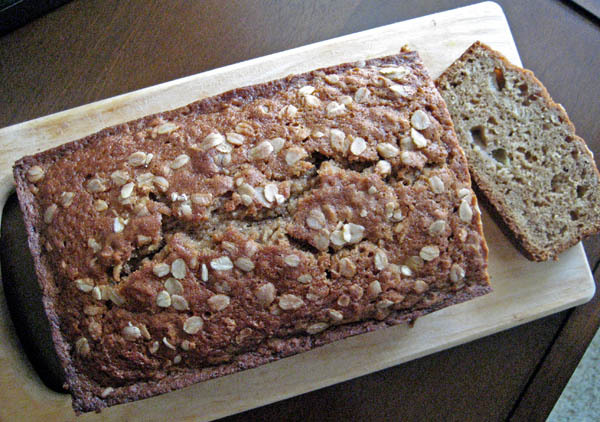 And no, you don’t need to bake your oatmeal applesauce bread a loaf of bread for saving the day, but you could, in which case you would have a loaf of bread all to yourself after you bestow the first one upon the deserving hero. 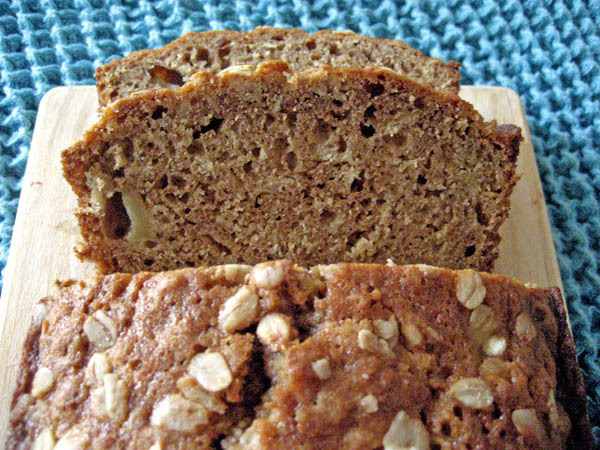 This bread rocks because you don’t need softened butter (who ever remembers to take it out of the fridge anyway), you don’t need to use a stand mixer and you’re more than likely to have oats and applesauce lying around. If you don’t, I suggest you restock your pantry. Mix dry ingredients, mix wet ingredients, combine dry and wet ingredients, pour into pan – WHAM! Bread fit for a hero! Or a neighbor. Or your mouth. Seriously, you’ll want to put it in your mouth with the way it fills your kitchen with the scent of cinnamony, appley goodness. If you don’t eat it yourself – you’re the hero. 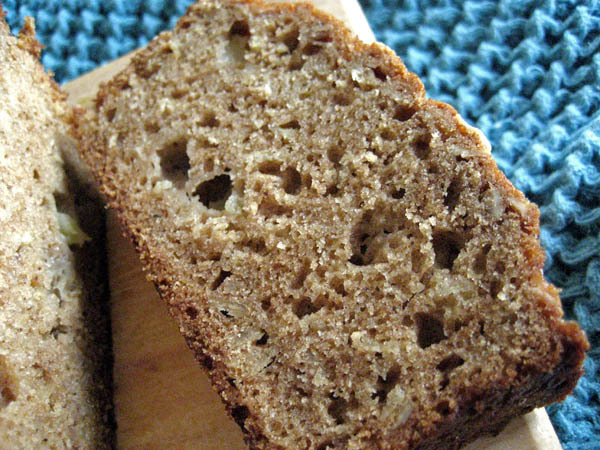 I found this bread on one of my favorite blogs: Tracey’s Culinary Adventures. I admire blogs that have something new posted every day and Tracey is one of those. She varies between sweet and savory and never goes too fancy or complicated on me. I omitted the nuts (cause I’m nuts enough) and added some chopped apples (because they were there). Feel free to use regular all-purpose flour for the whole thing if you don’t have white whole wheat flour. I only buy plain, unsweetened applesauce, so that is what I used and it worked just fine, though I did add an extra dash of cinnamon for good measure. Now go forth and bestow bread upon your heroes. I bet they’re hungry. I know I am. Duh. Preheat oven to 350 F. Coat a 9×5-inch loaf pan with nonstick cooking spray. Whisk the sugar, eggs, oil and vanilla together in a large bowl. Combine both flours, the baking powder, baking soda, cinnamon, allspice, nutmeg, and salt to a medium bowl then whisk to combine. Add the dry ingredients to the wet, mixing just until incorporated. Stir in the oats, applesauce and apples until incorporated, being careful not to over mix. Transfer the mixture to the prepared pan. Bake for about 1 hour, or until a toothpick inserted in the center of the bread comes out clean. Remove the pan to a wire rack and allow the bread to cool for about 15 minutes, then turn it out of the pan and cool completely on the rack. Love how simple this is, and that I’ve got all the stuff lying around already!